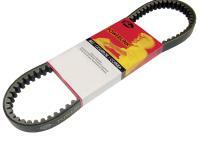 Gates Powerlink Premium CVT Drive Belt size 757-17-28. Fits the following, Poly Cord, Premium EPDM Construction. Aprilia Rally 50 (49cc) 2003-2004, Aprilia Scarabeo 50 (49cc) 1993-2006, Aprilia SR50 (50cc) 1997-2001, Italjet Dragster 50 (50cc) 1998-2004, Italjet Scoop 50 (50cc) 2003, Malaguti Ciak 50 (49cc) 2000-2005, Malaguti F12 Phantom (49cc) 2000-2005, Malaguti F15 Firefox (49cc) 2000-2005.